Trade Deficit Widens, Despite President Trump's Promises President Trump has pushed tariffs to cut the trade gap. But the United States bought more from other countries than it sold to them last year, pushing the deficit to a level not seen since 2008. A truck passes a stack of China Shipping containers at the Port of Savannah in Georgia on July 5, 2018. The U.S. goods trade deficit with China hit a record $419.2 billion in 2018. The overall trade deficit has grown by $119 billion in the two years since Trump took office. "We have almost an $800 billion a year trade deficit with other nations," Trump said in November 2017. "Unacceptable. We are going to start whittling that down and as fast as possible." The deficit, which is the difference between the goods and services the U.S. buys from other countries and those it sells to them, rose to a seasonally adjusted $59.8 billion in December — an increase of almost 19 percent. 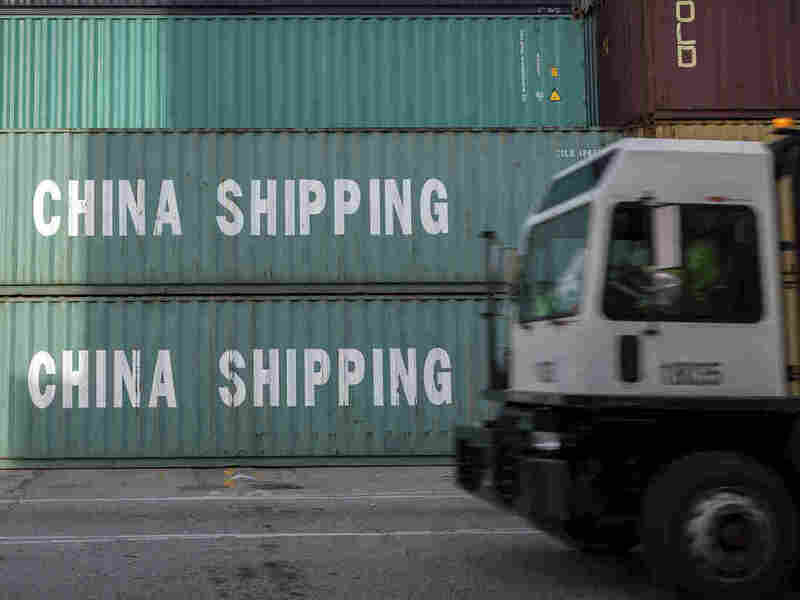 The goods trade deficit with China rose to a record $419.2 billion, despite Trump's decision last year to impose tariffs on $50 billion in imports from the country. He has also threatened to raise tariffs on another $200 billion if no progress is made in ongoing negotiations with Beijing. Trump also slapped tariffs, which are a kind of tax on imported goods, on steel and aluminum imports, a move that led to retaliation from some U.S. trading partners. The trade gap is growing in large part because the U.S. economy has been strong compared to other major countries. That typically means Americans buy more from other nations. Most economists do not consider a trade deficit to be a marker of economic weakness. But Trump has consistently singled out the trade gap as a target in his America First policies. Ironically, the administration's tax cuts may have actually helped to increase the trade deficit by juicing spending on overseas goods by consumers and companies. Also, the dollar strengthened against other currencies in the latter part of 2018, making foreign goods more affordable for Americans. The dollar's climb was partly due to a series of rate hikes by the Federal Reserve.